Daphne did her Inversgail homework and knows that Janet and her partners solved a previous murder. She tries to persuade them to join her in uncovering the killer and the truth. To prove she's capable, she starts poking and prying. But investigating crimes can be murder, and Daphne ends up dead, poisoned by scones from the tearoom at Yon Bonnie Books. 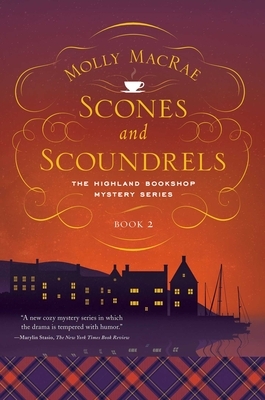 Now, to save the reputation of their business--not to mention the reputation of their scones--Janet and her partners must solve both murders. And Daphne's dog might be able to help them, if only they can get it to stop howling. . .